Champions for Christ since 1971. 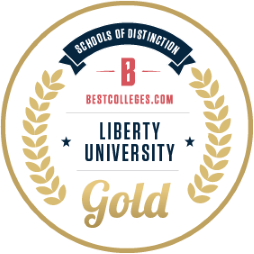 Liberty University’s online programs ranked #7 out of more than 2,100 colleges & universities for academic quality, affordability, and accessibility. -100% online programs at associate, bachelor's master's, and doctoral level. -Transfer up to 90 credits into an undergraduate degree program. -Up to 50% of your master's degree can be transferred in to help you get the most out of your hard work and maximize the credit you previously earned. *excludes licensure, certification, and some doctoral programs. -No standardized testing if you meet admission requirements. -Courses taught from a Christian worldview. -8 start dates a year, with an 8 week course format.